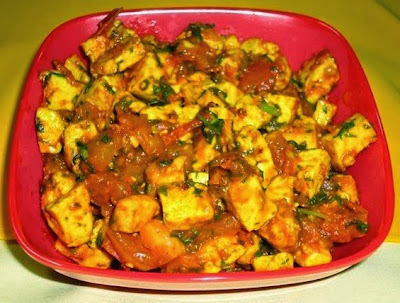 Paneer stir fry recipe - Try this easy, quick and delicious protein packed paneer stir fry for rotis and chapatis. It can also be packed in the lunch box with your favorite Indian flat breads. Paneer is rich sources of proteins. Proteins help in muscle and tissue building. Most of the time I make paneer at home. The paneer prepared with whole milk is so soft and dish prepared with it tastes great. Heat oil in a pan. Add crushed garlic and chopped chilies to it. Saute till the garlic and chilies become aromatic and light brown. Add the paneer cubes to it. Saute for 2 minutes. Add turmeric powder, chili powder and a generous pinch of kala masala or garam masala or any other sabzi masala. Saute nicely for 10-12 seconds. Add chopped tomatoes and salt. Mix well. Cover with lid and cook it on a low flame till the tomatoes become very soft and mushy. Stir in between. No need to add water. If it is too dry, sprinkle some water on it. When the sabzi is done, switch off the flame and add chopped coriander leaves. Mix well. Serve the paneer stir fry as a side dish for any main course dish. paneer curry looks very delicious.